* What is To Write Love On Her Arms all about? * To Write Love On Her Arms is a non-profit, correct? Denny: We are a non-profit organization. What we do, or what we believe our mission is to do, is to begin the conversation or at least change the conversation of mental health and to begin to somewhat normalize the conversation. We are trying to be honest about pain, hope, struggle, and specifically the manifestations of those, which can be specific disorders. Like I said in the mission statement, addiction, depression, self-injury, suicide, those are all topics within the mental health world that we are addressing and that in society are often kept mostly quiet. It’s uncomfortable for people to talk about it, it’s stigmatized. It’s not what you talk about with people. You don’t talk about the depression that your dealing with. You don’t talk about, the addiction that your struggling with. Those things aren’t talked about. So what we’re just trying to do is to be honest about our lives and to be honest about pain that exists in the life of a human and address it. Lets talk about it, so more than anything we’ve hoped to be that link between the places of help that exists; counseling centers, recovery centers, treatment centers, community, and those who need help. And so we try to be that link, the way we are that link, is that we address it, we talk about it, we speak honestly about it. And then specifically help people through information, through inspiration; help them get to that place of help. Help them take that first step to a councilor, or to a treatment center. We just try to come underneath people and help them through that process. * So what exactly are the TWLOHA UChapters all about, then? 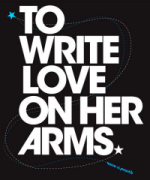 Denny: TWLOHA UChapters is a program of To Write Love On Her Arms that began officially Fall 2009. It is a program that is designed for college and university students. They exist to embody the mission, the values, and the vision of To Write Love On Her Arms on college and university campuses. So they are student lead communities on campus. * Now, are these programs funded by TWLOHA or is this funded by the students themselves? Denny: Part of there goal is partially fundraising. Doing activities, doing fundraising through activities to help support the national organization. The program is, at this point since its so early, it is funded by purely through the organization. * How do you think To Write Love On Her Arms will benefit from establishing all these UChapters across the country? Denny: TWLOHA will benefit in that it is fulfilling our mission of presenting hope and finding help, inspiring, encouraging, and informing. With fundraising and investing into treatment and recovery. So the simple answer is that these chapters exist to fulfill the mission of TWLOHA. They are real communities and extensions of TWLOHA throughout the United States and even into Canada right now. Where they are carrying out the mission of TWLOHA, and so its a way for the organizations mission, vision, and values to extend. * If there’s someone who would like to start a chapter at a school you didn’t get a chance to visit, is there a way for them to do that? What’s the best way for them to start that process? Denny: The way they have to start the process is emailing our ‘chapters’ account, chapters@twloha.com. And at that point we have a requirement, for them to go to a training conference or to go to our MOVE community conference. They attended one of these conferences and through that, its just a way for us to connect with them and to build a relationship with them. But also for them to understand the dialogue, the language, of TWLOHA. So thats the first step, after contacting us, then we direct them to the next MOVE community conference. They go there and at this conference they receive all the details on where to begin. At the conferences we have ‘UChapter break outs’, and during that break out session I lead that portion of the conference and give them all the information they need to start the next step. * Are there any specific qualifications for someone who is interested, other than that? Denny: They have to be a student and they have to abide by school policies. They would have to be an enrolled student at a university or college to start a UChapter. * Do you think music helped with the conversations? Denny: Yea, music is something that TWLOHA has used often to carry out its message. Specifically on this tour we are utilizing the art form of music to help inspire conversation about the themes of pain, hope, and community. So ultimately we believe that music uniquely moves people emotionally and stimulates people on another level mentally. We hope that through this music we can kind of draw conversations out of people. * So this is the wrap up date. How has the tour been so far, how has the response been from the past campuses? * Where have you gotten the biggest response? You said Canada had an audience of 60? Denny: The biggest response was in Canada. We had two, well we had three in Canada. We had two at colleges and universities, University of Winsor and then Trent University. Both of those were 50+ people that showed up. They were really excited, and part of that is due to TWLOHA seldomly being in Canada, due to normal reasons. So, they were excited. * Definitely. So what else can we expect from TWLOHA UChapters? Denny: Well, were in a position where we want to be intentional and careful about the number of chapters we start up. There’s a large response from students who are at a college or university and they want to be involved with TWLOHA. So they are really inspired to start something. While there’s been a large response, its only 2 semester in existence, we’re really trying to be careful about the number that we launch each term. At this point its about 24-25 through out the US and Canada right now. So the goal is to stay in the United States and Canada right now. Each term we’ll launch about 10 to 15. We don’t know where it’ll end up going. We’re just taking it term by term, because it is such a brand new program. After each term we’ll evaluate and decide how many more can we launch with it still being managed well. Where our systems can still really maintain that many chapters. We want them to feel connected to the larger organization. We hope to keep growing.